Gone are the days when people were afraid to see the sausage being made. As dining interests shift towards local and artisanal meats, chefs, farmers and butchers in the area are turning to charcuterie. Sausages in particular offer opportunities for creativity. Charcutières at longtime culinary retail institutions like Savenor’s Market and Formaggio Kitchen research recipes from across the globe, methodically testing out and rejecting batch after batch in order to perfect their recipes. 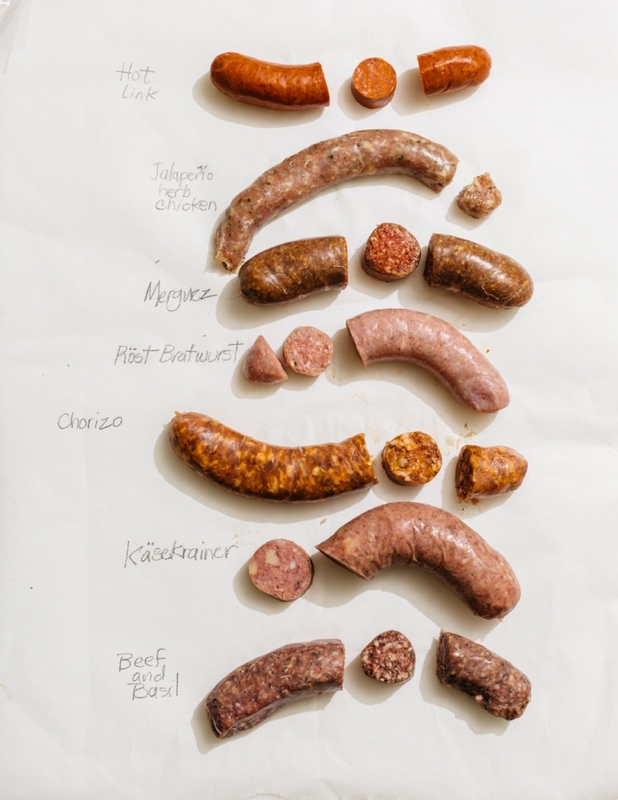 Once you put the traditional Texas-style beef-and-pork hot link by New England Charcuterie on the grill, there is no going back to the run-of-the-mill supermarket brands. New England Charcuterie, the magic at the acclaimed Moody’s Delicatessen on Moody Street in Waltham, has become successful enough to expand the charcuterie operations from a small space in the deli to a larger facility nearby. If you’re looking to fancy-up your neighborhood cookout fare beyond the classic squiggle of yellow mustard, opt for a heap of chili with crumbled beef and extra heat. This family-run butcher shop in Middleton uses sustainable business practices for all their meats, including the birds that go into their chicken sausage. The salty, robust chicken flavor gets a kick from tiny chunks of green jalapeño. Work the sausage into a tomato sauce with onions and more jalapeño, heaped over a pile of spaghetti. Lamb and cumin is a flavor combination that resides in the stratosphere, and the team at Julia Childs’ favorite butcher showcases it flawlessly in their merguez. This spiced North African sausage also has coriander, garlic, caraway and harissa in Savenor’s rendition, with a buttery flavor that makes it a standout on an already star-studded sausage lineup. For a quick snack, pan-fry the sausage and put the chopped pieces on French bread with drizzled pan juices. If you have more time, serve atop a bed of lentils with mint and crumbled feta. Karl’s Sausage Kitchen serves German and Northern European food, including—as one would hope—many varieties of house-made sausages. The röst bratwurst, a thick and short German sausage, is one of the stars. Whole caraway seeds add aromatic notes to the rich blend of pork and veal. Vinegary German potato salad with bacon is a classic bratwurst pairing, but for a sweet fix, add a simple applesauce as a condiment. This small neighborhood butcher shop makes its aggressively spicy Mexican pork sausage with white wine and cumin, textured with bits of onion and whole chili flakes for a mouthwatering and eye-watering bite. Simmer red and yellow peppers in a pool of vinegar as a side dish, and, as a competition, see whether your taste buds will be overwhelmed by the tang of the vinegar or the heat of the sausage first. If anyone is going to be putting cheese into your sausage, you want it to be the folks at the renowned New England capital of cheese shops. This sweet Austrian pork sausage is dotted with oozy golden nuggets of Gruyère Alpage for an umami- driven indulgence. Keeping with the big bold flavors, your pairing needs no more effort than spreading yellow mustard over lightly toasted rye bread and topping with coins of hot käsekrainer.